Paperback, 4.25 x 6.5 in. / 64 pgs / 22 color. 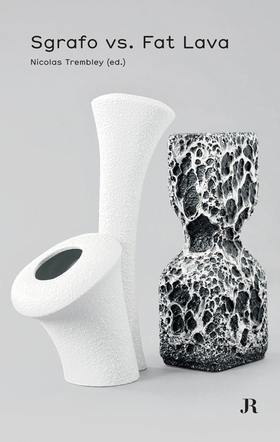 From Raymond Loewy’s austere “Form 2000” teapot set of the mid-1950s to the Sgrafo vases of the 1960s and the improbable “Fat Lava” glacis of the 1970s, postwar German ceramics exhibited a tremendous stylistic diversity, mixing references to Op art, geometric abstraction, the funky, angular designs of Werner Panton and the biomorphism of hippie aesthetics. Both famed and anonymous designers translated the various aspirations of a postwar Germany under reconstruction into exaggerated, semi-futuristic shapes, as well as pursuing cooler, more stripped down effects. Sgrafo vs. Fat Lava explores this fertile tension in German ceramics, with reproductions of relevant works, an essay by the ceramics specialist Horst Markus and an interview with designer Ronan Bouroullec. Featured image, of a piece produced by Royal Porzellan Bavaria KPM – Kerafina, is reproduced from Sgrafo vs. Fat Lava. 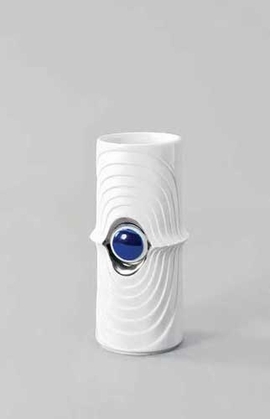 "Though the idea of a collection as such never crossed my mind, the act of collecting vases ultimately yielded a good paradigm for constructing one. Still, I had to make a selection in choosing from this vast sea of production that represented more than 60 studios. At first I was guided only by my subjectivity, by questions of taste and an instinctive attraction to one form over another on the basis of their references to other creative fields. It quickly became evident that there was a coherent whole in the making. I would reconstruct families of objects where the ugly could become beautiful and the pariah the prince. There were different sizes and variations in volume for each form, and variations in color for each size. Throughout the project, I had to limit the number of choices, as in a puzzle. There were alternating phases of exaltation, disappointment, and even disgust, related to the acquisition or loss of a rare piece. Regardless of how modest this series of vases is, I have never stopped building and un-building it; I am constantly discovering new combinations and paths. The pieces have taught me about the chemical composition of enamel, about interior decoration, and even about the emancipation of the German housewife." Excerpt is from Nicolas Trembley's chapter, "Proust’s Madeleine and 'Fat Lava,' reproduced in Sgrafo vs. Fat Lava. FORMAT: Pbk, 4.25 x 6.5 in. / 64 pgs / 22 color.